Silver prices followed spot gold lower yesterday, ending the trading day with a wide spread down candle which marginally breached the 9 day moving average, suggesting that the recent sharp rally higher for spot silver, may have come to a temporary halt. 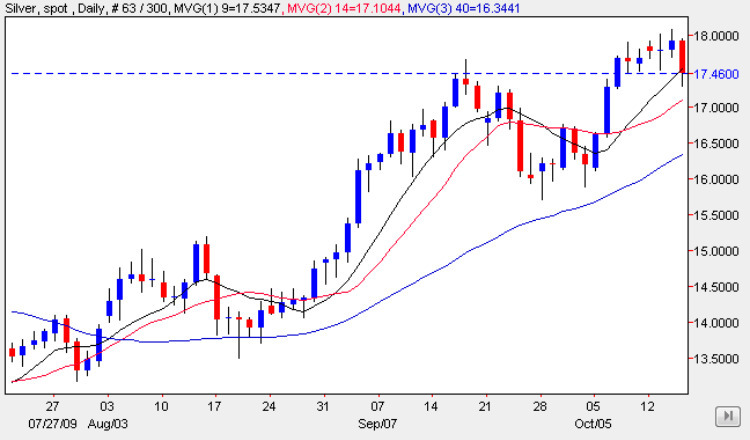 Indeed the bearish engulfing signal could be a portent of a more significant change in the underlying sentiment for silver prices, and this may only be confirmed in the next few days if we see the support level in the $16.75 to $16.85 breached in due course, or whether this level provides the necessary springboard for a continuation in the bullish trend of the last few weeks. Given the bullish nature of gold prices at present I suspect that this may simply be a short term technical pull back as the silver market takes a breather, along with gold, before recovering it’s momentum and pushing higher once again. However, for any signals we need to watch the 14 day moving average which may provide a clue should we see spot silver prices bounce of this technical indicator in due course.